The story of seven-time Italian prime minister Giulio Andreotti's controversial leadership in the latter stages of his 50-year service, which saw him accused and tried for having an alliance with the mafia, as well as being an accomplice to several murders of his key rivals, is an impressively stylized and cinematically-inspired take on what could have been familiar and morose subject matter. 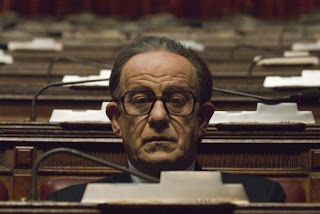 Comparisons of director Paolo Sorrentino to Martin Scorsese were made after its Cannes premiere, and were not unfounded, as the film works best in its numerous, energetic, pop culture aware montage sequences. Scorsese's style never trumps his substance though, which can't be said about Il Divo, whose dense and near-incomprehensible narrative is neglected in favour of Sorrentino's cinema gymnastics. If anything, the film comes off like the Lock, Stock and Two Smoking Barrels of political films. Nicolas Winding Refn's Bronson also makes a good comparison. Like Refn's film, Il Divo works best as a subjective expression of a man, as opposed to a traditional narrative story. Unfortunately, Sorrentino wants to have his cake and eat it too. Even up until the last moments of the film we're still meeting new characters, so many that each person has to be introduced with a graphic describing his/her name, title and relation to Andreotti. Granted, the design and use of these graphics are incorporated with wicked hipness into the composition of the scene, but it's just too much information to keep track of. Style aside, Il Divo suffers most from Sorrentino's direction of lead actor Toni Servillo; his performance, which has been lauded by other critics as an enigmatic, Yoda-like, zen master portrait of political savvy, comes off as un-expressive, robotic and dull as cardboard, under cover of a bad wig that wouldn't pass muster on a Saturday Night Live sketch. To each his own, as the virtues and failings of this picture will likely divide audiences. It's a shame foreign releases like these don't get the Blu-Ray treatment because for a film that relies so heavily on its stunning visuals, the boring old standard definition DVD just doesn't cut it. The DVD contains just the movie with no special features. oh man, i could not agree more with this review, Alan. i had high hopes for this film and was definitely let down.